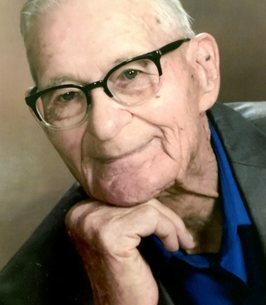 Mr. Elvis Hill Barber, age 95 of Leesburg, Texas passed away on Friday, October 5th, 2018 in Winnsboro. He was born on March 22nd, 1923 in Hillsboro, Texas to the late John Barber and Ora Lee Barber. He was a retired farmer, a member of Pine Street Baptist Church, where he served as an active deacon and was a member of the Second Milers Sunday School Class. He was preceded in death by his parents, wife, Annie Barber, sons, Kenneth Karl Barber, Alvie W. Barber and Olen Glen Barber; daughter, Rachel Ann Myers and great grandson, Timothy Mason Ridenour. He is survived by his daughters, Martha Ridenour and her husband Earl of Daingerfield, Sarah Hatcher and her husband Eddie of Dallas, Naomi Lavelle Williams and her husband Andy of Caddo Mills; brother, Sherman Barber; nine grandchildren, twenty great grandchildren and three great great grandchildren. Visitation will be held on Sunday, October 14th, 2018 from 1:00 pm to 2:00 pm at Beaty Funeral Home-Winnsboro 816 W. Broadway Winnsboro, TX 75494. Funeral Services will be held on Sunday, October 14th, 2018 at Beaty Funeral Home at 2:00 pm, Bro. Charles Ethridge and Br. Richard "Nub" Brown conducting. Interment will follow at Piney Grove Cemetery in Winnsboro, with Toey Courtney, Jay Murdock, Burke Bullock, Neuman Browning, Keith Anderson, Jason Noll serving as pallbearers. To send flowers to the family of Elvis Hill Barber, please visit our Heartfelt Sympathies Store. We encourage you to share any memorable photos or stories about Elvis. All tributes placed on and purchased through this memorial website will remain on in perpetuity for future generations. Sending Big Bear Hugs your way, Love ya'll bunches!